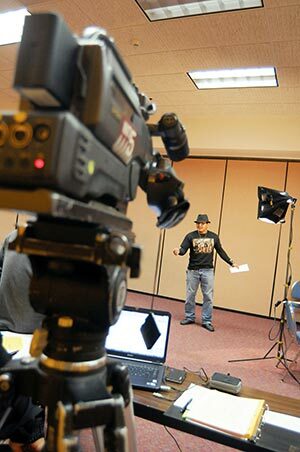 By Noel Lyn SmithTom Mark stood in front of a camera in a small conference room inside the Navajo Nation Museum and recited lines in both Navajo and English while his performance was recorded. Mark, 63, was auditioning for the character Wilbert Tsosie for the upcoming feature film "The Broken Circle." The movie is based on the 1992 non-fiction book of the same name, which uses the 1974 torture-murders of three Navajo men by three Anglo teenagers near Farmington to examine racial tensions in the community and the impact of the murders.And:Several familiar faces from the Native American entertainment industry were in attendance at the Window Rock casting call. Among those waiting in the museum's lobby were actor and martial artist Reggie Mitchell, entertainer Cody Nez, musicians Gabriel Yaiva and Robert Tree Cody. In a nearby exhibit hall, Ernest Tsosie III sat on a bench studying the script. "(I'm) trying to get into the movies," Tsosie said jokingly.Another interesting project:Recently, Tsosie worked with fellow actors Natasha Kaye Johnson and Tatanka Means to develop a comedy show along the lines of "Saturday Night Live" and "MADtv." The show premiered Dec. 12 in Albuquerque and another show took place Dec. 18 at Mesa View Elementary in Chinle.Comment: For more on the subject, see The Best Indian Movies. Below: "Cody Nez reads the part of Wilbert Tsosie while auditioning for 'The Broken Circle' at a casting call Dec. 10 at the Navajo Nation Museum in Window Rock."